But there is not ! I tryed to fight the crocodillo but it almost killed me. Because that very wet dough drowned my flour. It's all about the flour ! Really , no excuse , but it is. Our Dutch flour isn't as strong as they use in..lets say the USA . Or France. It simply does not have the high amount of gluten . And we have a lack of sorts of flour here. Flour is flour and thats it. But it doesn't have enough gluten. It's simply not strong enough to hold a...crocodile. And then there is my flour : I mill my own grain, become wholewheat or sift it when I need white flour . Great ! And all without pesticides and so , because I only use organic. No poisons in my bread. But ,as I found out, also not as many strenght as usual flour.I always put in less water than the recipe askes for.And a little gluten if needed. But I can live with that. And I do bake like that for years now. My beloved flour became a fluid dough, to wet and weak ( and by far not enough gluten ) to hold a croc. It dripped from my countertop too, right on to the floor . Adding more flour, (I did , but it needed scoops and scoops) was not an option because it would change the recipe too mutch and my croc would turn in to a Ciabatta or something like that. So...I stopped.Trying to find other flour was also no option, I want to bake with my own stuff. And that reached the border : this bread was over the top for me. But I learned a lot and we had lots of fun at BBB's . I also learned a lot of new curses and bad languages in Englisch : Boy, did we all fight that Crocodile ! I wish you all the luck with this bread, you'll need it ! But they say it's worth it !! You were so brave, battled the croc and survived the wiser! Yikes! Sounds like you needed a bucket for your dough. But, you battled, survived with a few bites and have lived to tell tale. I loved how this recipe really brought out the differences in the flour we all use. Yes, I'm glad you survived the croc, lived to tell the tale, made your travel to that unnamed place, and will battle and laugh with us again. You are so right about the flour, but if you have the right flour it is a children's play. Believe me I know what you are talking about. 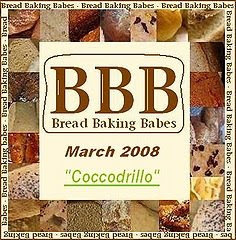 Even your suit in armor was no help to this flour in the croc! You made me laugh so much! Ah well you can't win them all, you tried and one day you'll tame your croc, I'm sure. Hope the next one is somewhat easier! !